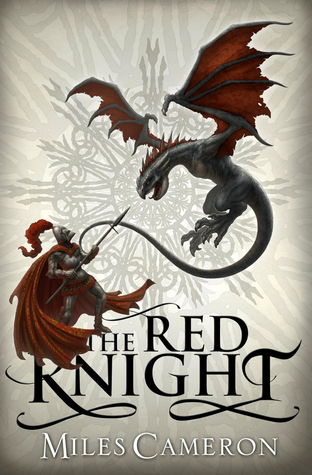 The Red Knight is Miles Cameron's debut novel, but you really couldn't tell from the quality of the work. In a sentence, it's a bloody, gritty, emotionally wrenching, clever piece of writing. It promises a fantasy world with trappings of historical accuracy, and it delivers. It promises violent,, fast paced, realistic battles - and it delivers. It promises characters you'll care about, with thoughts, feelings and motivations that make sense, and make them real - and it delivers. It promises dialogue that is snappy, smart, and spoken like real people - and it delivers. It promises the potential Next Big Thing in fantasy - and it delivers. There are comparisons to be made between Miles Cameron and the likes of Joe Abercrombie and George R.R. Martin; the style of work, at least, is similar - characters in a hard, brutal world have been shaped by that world into individuals who are, let us say not very nice, but do make compelling protagonists. Cameron's world is one reminiscent of late medieval Europe - with bands of roving mercenary knights selling their services in conflict to the highest bidder, and with nations always poised on the verge of external or internal conflict. But against this familiar historical backdrop, Cameron gives us an external focus - "The Wild" - an area of liquidity and change, where what is and is not real becomes more fluid, where wonders and monsters are born, and regard the lands populated by humanity as their own. The setting is interesting, and obviously well researched, and drawn with a fluid brush that moves between the broad strokes of political organisations and geography, down to the fine detail of individual households with equal clarity. The book is worth reading for the world alone. Fortunately, however, the rest of the text is equally solid. The cast of characters is many and varied, and more than a few of them are deeply unpleasant people. Ironically, the forces of `The Wild', which stands in opposition to humanity, are often portrayed more sympathetically than the protagonists and the forces that aid and abet them. I'm fairly sure this is intentional. The protagonists are (largely ) an unruly and unpleasant bunch of mercenaries, following a mysterious leader, in search of the greatest amount of profit. Many of the supporting characters are more names and a set of traits than anything else, but others have solid motivational moments, and are developed, if not into three dimensions, then at least two and a half. The `Point of view' characters take this a step farther, and give us solid motivations, logic, raw emotions - explanations for actions which are internally consistent, plausibly done, and often surprising. After a while, the characters seem to step off the page and become people, more than marks on a page. The plot, the events that these characters find themselves in, is a little less convincing than the world and the characters - but it is utterly relentless, action packed, and almost forces the reader to turn every page, in need of finding out what happens next; if, for example, Robert Jordan's "Wheel of Time" series is the fantasy genre's "Great Expectations", then this is fantasy's "Die Hard" - action, adventure, the odd brutal murder, and a plot that seems a little hackneyed, but is so much fun to read that you really don't care. Overall, this is a book with a beautifully drawn, well realised world, populated by believable (and often believably awful) characters, with a page turning plot that will leave you not wanting to put the book down, and once you do, wanting more. It's a doorstop of a novel, but every bit of it is very, very good indeed.